Fiorano Integration Platform obviates point-to-point integration efforts and integrates heterogeneous applications, databases, cloud and other systems streamlining the complex architecture of an enterprise. Organizations can deploy the light-weight, powerful and scalable as their IT infrastructure backbone to enable real-time information exchange across the enterprise and partners. 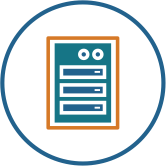 The Fiorano Integration Platform enables your organization to overcome the complex integration hurdles and allows seamless communication among your applications, databases, partners, suppliers, employees, stakeholders and more, delivering unprecedented value to the enterprise. The Fiorano Integration Platform implements a brokered, peer-to-peer system architecture, which combines the management benefits of centralized hub-and-spoke systems with the performance benefits of fully distributed peer-to-peer systems. The Enterprise Servers are the repository for flows and act as administrators for the peer servers. 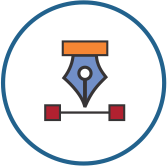 The Fiorano Studio allows end-users to rapidly compose enterprise-scale, interactive business-solutions in the form of event-driven distributed business processes. With the studio, the logical application design is mapped directly to the physical implementation, making the development process easier and more intuitive than that of conventional integration suites. Fiorano Microservices provide the key to enhanced interoperability with a wide variety of applications and technologies. Fiorano has built an impressive catalog of 100+ microservices that reduce the effort required to integrate business applications. The customizable plug-n-play microservices enable simple installation, deployment, and configuration of "no-code" connectivity solutions. With Fiorano Integration, your enterprise can shift its focus from non-productive maintenance plans to new innovation and value creation projects. Fiorano's easy-to-use and deploy platform dramatically reduces development costs. Enterprises that have deployed the Fiorano Integration backplane have achieved 40-80% productivity gains compared to other solutions. Enterprise software resources when organized as services make it easier to expose functionalities for internal and external consumption. Apart from reducing time-to-market, this also increases organization transparency and customer satisfaction. Business processes rely on underlying software. With rapidly evolving markets, business process implementations need to be modified in near-real time, a process easily facilitated by the flexibility of Fiorano Microservice-based architecture. 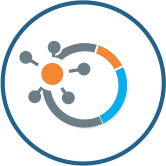 Easy service orchestration and choreography allows rapid deployment of new integration flows enabling organizations to quickly adapt to evolving external business and environmental events. Software re-use is the primary benefit of Microservices and with Fiorano Integration Platform is used as a means to reduce the cost and time of new application development. Microservices increases IT responsiveness and facilitate competitive business change. Fiorano ESB obviates point-to-point integration efforts and integrates heterogeneous applications, databases, cloud and other systems streamlining the complex architecture of an enterprise. Organizations can deploy the light-weight but powerful and scalable Fiorano ESB as their IT infrastructure backbone to enable real-time information across the enterprise. 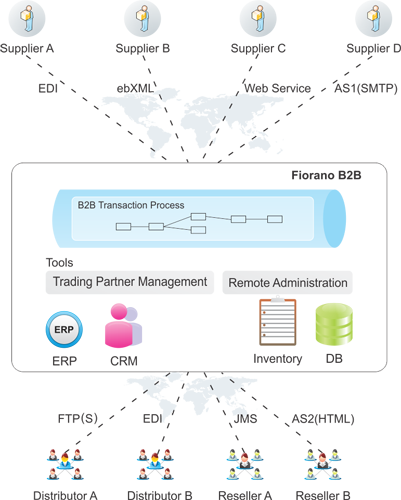 Fiorano B2B™ is an enterprise-level B2B gateway for transacting business electronically with trading partners, distributors, vendors, banks and customers worldwide. 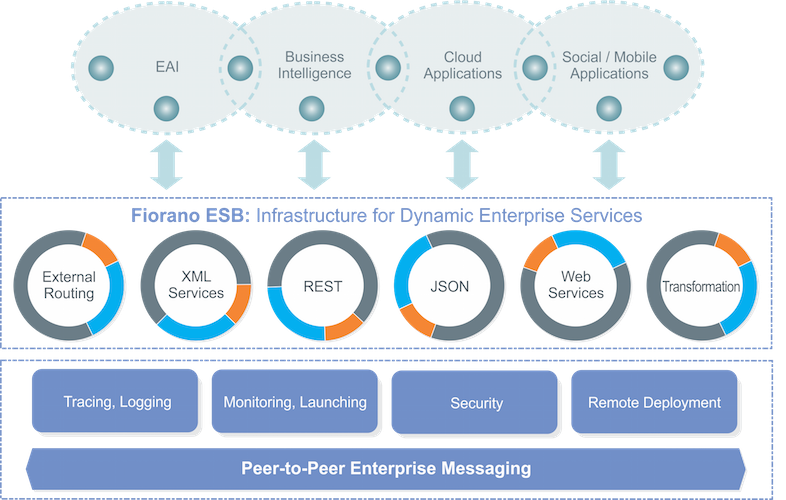 Built on a scalable, peer-to-peer hybrid ESB architecture, Fiorano B2B provides secure communications, data transformation and governance between a consolidated community of external business partners. Fiorano B2B enables the secure exchange of business documents and automates cross-company processes and B2B transactions including purchase orders, requisitions and invoices. With support for all major transport and business protocols, as well as data formats such as XML, electronic data interchange (EDI) and flat files, while giving suppliers browser access, email routing and PDF optical character recognition (OCR) options to transmit data, allowing multichannel integration. Fiorano B2B enables accurate, real-time information exchange across the extended enterprise.